Almond Peach Bread the best way to end Summer is with a Fresh Peach Sweet Loaf. Add chopped peaches, almond topping & nothing else is needed! **Room temperature - remove from fridge 30 minutes before using. Pre-heat oven to 350F (180C) and flour and grease a 9x5 inch (22x12 cm) loaf pan. In a large bowl beat on medium speed beat the butter and sugars until creamy (about 3 minutes) then add the egg, yogurt, milk and vanilla, beat to combine. In a medium bowl whisk together the flour, baking soda and baking powder. Add the flour mixture to the creamed mixture and stir with a wooden spoon just until combined. Gently fold in the chopped peaches. 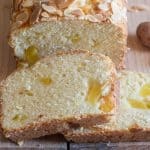 Spoon into the prepared loaf pan and top with the sliced almonds. Bake for approximately 35-40 minutes, (test with a toothpick). Let cool completely before slicing. Enjoy!